In June 1938, Chinese Nationalist armies under the command of Chiang Kai-shek breached the Yellow River’s dikes at Huayuankou in Henan province in a desperate attempt to block a Japanese military advance. For the next nine years, the Yellow River’s waters spread southeast into the Huai River system via its tributaries, inundating vast quantities of land in Henan, Anhui, and Jiangsu provinces. Perhaps the single most environmentally damaging act of warfare in world history, the strategic interdiction threw long-established water control infrastructure into disarray, leading to floods that persisted until the Yellow River was finally returned to its previous course in 1947. Between 1938 and 1947, this disaster killed more than 800,000 people in Henan, Anhui, and Jiangsu and displaced nearly four million. After Chinese and Japanese armies had clashed at Marco Polo Bridge in July 1937, the Japanese military launched a full-scale offensive into the heart of China, seizing Nationalist China’s capital of Nanjing in December 1937 and perpetrated brutal atrocities against its civilian residents. The Japanese then set their sights on Wuhan, where the Nationalist regime had relocated. In early 1938, the Japanese army launched assaults from the Jin-Pu railway’s northern end at Tianjin and from its southern terminus near Nanjing. After meeting at the rail junction of Xuzhou, the Japanese planned to move west toward Zhengzhou in Henan, the junction of the east–west Long-Hai and the north–south Ping-Han railways, advancing south along the Ping-Han railway toward Wuhan. The Japanese army anticipated little resistance in the Xuzhou campaign, but to their surprise Chinese armies held out for nearly five months. When they took Xuzhou in late May, the Japanese moved to bring the war to a decisive conclusion, striking west along the Long-Hai railway in order to press south along the Ping-Han railway and attack Wuhan. After the city of Kaifeng in Henan fell in June 1938, the Japanese focused their assault on Zhengzhou. Chinese armies kept the Japanese from crossing the Yellow River by destroying the railway bridge north of the city, but had little chance of maintaining their position for long. With the Japanese poised to capture Wuhan, the collapse of China’s entire war effort seemed a distinct possibility. As the tide of war turned against them, Nationalist military officers raised the possibility of breaking the Yellow River’s dikes to impede the Japanese. The objective was to cut the Long-Hai railway, which ran along the river’s southern bank, before the Japanese could reach Zhengzhou, thereby halting the enemy’s advance and ensuring the retreat of Chinese armies. Otherwise, Wuhan would fall in only a matter of days, the Nationalist regime might not have time to withdraw, and China would likely have to surrender. Breaking the dikes was a product of utter desperation. Nationalist leaders accepted this stratagem as a military necessity. For them, national survival outweighed the damage they knew the floods would cause. 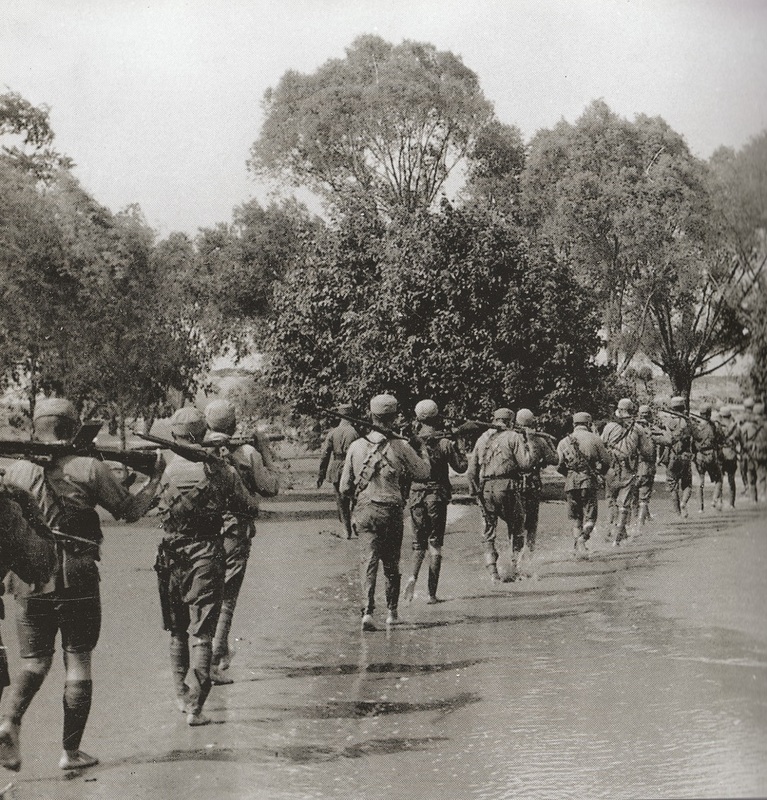 Chinese Nationalist troops walking through Yellow River floodwaters. Source: Guomin zhengfu Zhongyang xuanchuanbu. Courtesy of Qinfeng lao zhaopian guan, Kangzhan Zhongguo guoji tongxun zhaopian. Guilin: Guangxi shifan daxue chubanshe, 2008. But breaking the dikes proved more difficult than anticipated. On June 4–6, Nationalist armies made two failed attempts to hollow out and blast open the dike at Zhaokou in Henan’s Zhongmu County. Only minimal public warning was given, lest the Japanese find out and accelerate their advance. From Wuhan, Chiang Kai-shek telephoned military commanders in Henan to ensure his orders were carried out. A second attempt to break the dike by excavating it was made at Huayuankou, north of Zhengzhou, a few days later. On June 9 the river’s waters spilled through the opening. The breach occurred at a critical juncture, with the Japanese less than 50 kilometers away. The river’s turbid waters, not yet swollen by yearly summer rains, moved slowly at first. But floodwaters rolled steadily out of the dike opening and advanced southeast, cutting off the Japanese army’s path. Only people living in the immediate vicinity received any sort of warning from the Chinese authorities. Yet the flat, alluvial plain of eastern Henan was densely covered with farm villages and fields. The Japanese advance came in the early summer rainy season, when the river’s floodwaters were at their highest. Over the next few days, the river rose and weakened defenses at Zhaokou as well. From this point, the Yellow River flowed southeast across Henan’s flat eastern plain. As rains fell and the river cascaded onward, its waters spread across the landscape. News reel clip of the Yellow River floods in central China, 1938. The flood coincided with the peak agricultural season, when wheat stood ripe in the fields or lay newly harvested, ready for threshing. Hesitant to abandon crops and fields, rural residents left their farms only reluctantly. Some villagers tried to build or strengthen dikes to protect their land and homes, but when waters actually came, many people decided to flee. Those not caught completely by surprise stacked their possessions on wheelbarrows and ox-carts or carried them on shoulder poles, joining the long lines of refugees. People tried to rescue young children and the aged. They tried to save tools, livestock, grain, and other belongings but there was not enough time to salvage everything. Many people drowned in the flooding; far more would succumb to illness or hunger in the difficult months and years that followed. To the east, however, the river’s diversion halted the invading Japanese, who abandoned their westward march. The vital railroad junction at Zhengzhou was held for the time. The city of Hankou, China’s provisional political center after the fall of Nanjing, won a temporary breathing spell. Strategically, breaking the dikes may have bought the Nationalist army time to withdraw and regroup, bogging down Japanese tanks and mobile artillery in fields of mud as Chinese forces secured their defenses around Zhengzhou. By preventing the Japanese from taking the railway junction, some scholars argue, the river’s diversion postponed the seizure of Wuhan by several months, giving the Nationalist government time to relocate its capital to southwest China in the city of Chongqing. But the Japanese simply redirected their advance from a north–south land attack along the railways to an amphibious assault along the Yangzi River that combined naval and infantry forces. Wuhan fell in October 1938, after the Nationalist central government had withdrawn into China’s interior. Yellow River flood disaster victims. Once Wuhan fell, the Sino-Japanese War settled into a stalemate. The major battles were over, though guerilla warfare continued. With its advance halted, the Japanese army occupied most rail lines and urban centers in northern and eastern China. The Chinese Nationalist regime consolidated its control over the northwest and southwest parts of the country. Frontlines were defined largely by topographical features. The Japanese army could not fight a mechanized war in the mountains and hills that divided China’s occupied and unoccupied territories, nor could they function in the vast flooded area created by the Yellow River. Any immediate strategic benefits gained from the Nationalist gambit of turning the Yellow River into a weapon came at a tremendous price. Once diverted, the river flowed unimpeded across eastern Henan’s landscape, which had a generally higher elevation in the north than in the south, it left the channel it had followed since 1855 and took a new course. No topographical divisions prevented the river from moving southeast to join the Huai River. Advancing at a steady rate of around 16 kilometers per day, floods spread into narrow, shallow beds of rivers and streams that flowed toward the Huai. Floodwaters filled these waterways and broke their embankments, causing them to overflow and inundate fields to the east and west. 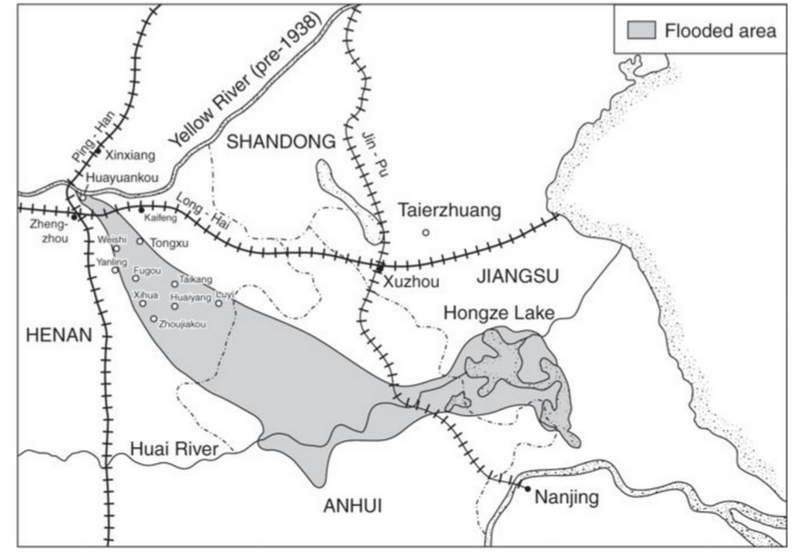 In early July 1938 the floodwaters entered the headwaters of the Huai River, turning northeast to cut across the Jin-Pu railway before pouring into Hongze Lake. The lake overflowed and waters burst into Jiangsu, flowing in three streams toward the Pacific Ocean. Nature’s rhythms heightened the catastrophe, as high levels of summer precipitation increased the flooding’s severity. Especially heavy rains fell throughout June and July. Waters surged as a result. Japanese artillery bombarding banks of Yellow River. Throughout World War II, Chinese and Japanese armies engaged in hydraulic warfare as they struggled to harness the river’s energy and deploy it against their military adversaries. Following the river’s diversion in 1938, Chinese and Japanese armies confronted one another across its new course, making it a strategically vital frontline area. Military actors on either side expended huge amounts of energy working with, on, and against the river to attain objectives, undertaking projects to channel and redirect its flow to fortify their positions and deploy it against their enemies. To carry out wartime hydraulic engineering projects, military forces and water control agencies that affiliated with them had to mobilize massive flows of labor and materials. But as refugees fled Henan in the wake of the 1938 flood and famine struck the province in 1942, those resources became extremely difficult to obtain. The task of providing these inputs placed an even greater burden on localities that had already been devastated by warfare and flooding. The Yellow River was not a passive object in these struggles, but acted to frustrate human efforts aimed at shaping its behavior for military purposes. As in times past, the Yellow River twisted free from human control, as the river silted up, flooded over, and changed its course. At the same time, hydraulic engineering systems greedily consumed resources in a futile effort to keep the river in check. In a time of total war, when armies devoured or destroyed virtually all available resources, this cycle grew even more vicious. News reel clip of Chinese workers ‘re-harnessing’ the Yellow River, 1946. The huge amount of sediment deposited by the river added to the disaster, with the threat of flooding growing as siltation caused the river’s bed to rise. The river deposited millions of tons of silt, which spread over vast areas of land. Dikes constructed by Chinese and Japanese, along with the inability of hastily built structures to contain the river’s flow, also influenced the floodwaters’ movements and distribution. Together, siltation and wartime dike construction made the river meander and shift unpredictably, causing the total area impacted by floods to expand. With the deposition of this sediment every year, the area covered by floods shifted in an arc swinging to the south and west. 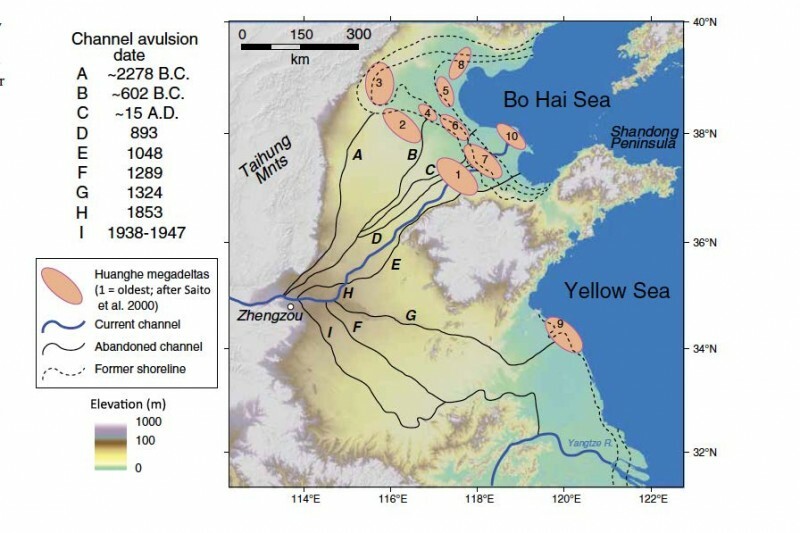 With the Yellow River’s diversion, its sediments also damaged the hydrological system of the Huai River and its tributaries, throwing that drainage system into disarray. 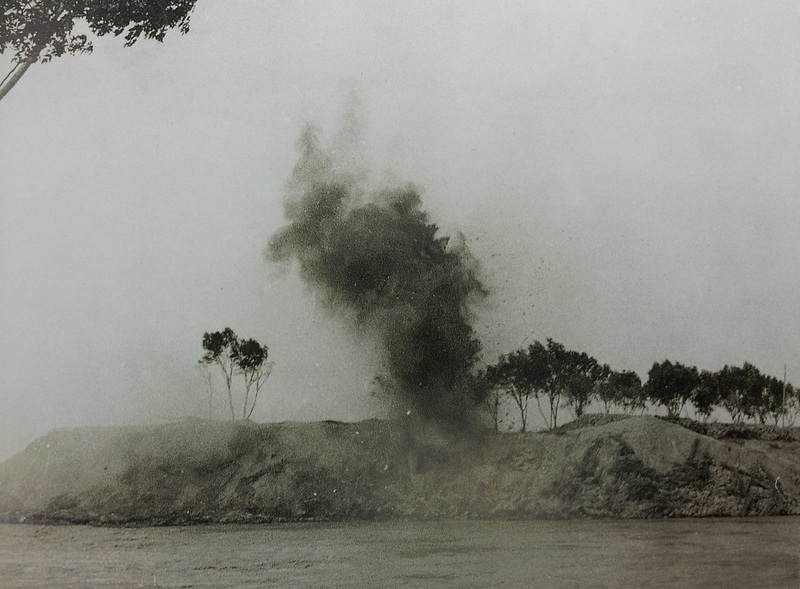 Between 1938 and 1945, dikes along the Yellow River’s course broke dozens of times at numerous locations. As drainage capacity drastically reduced, floods grew more severe and the potential for disasters in the Huai watershed grew as well. 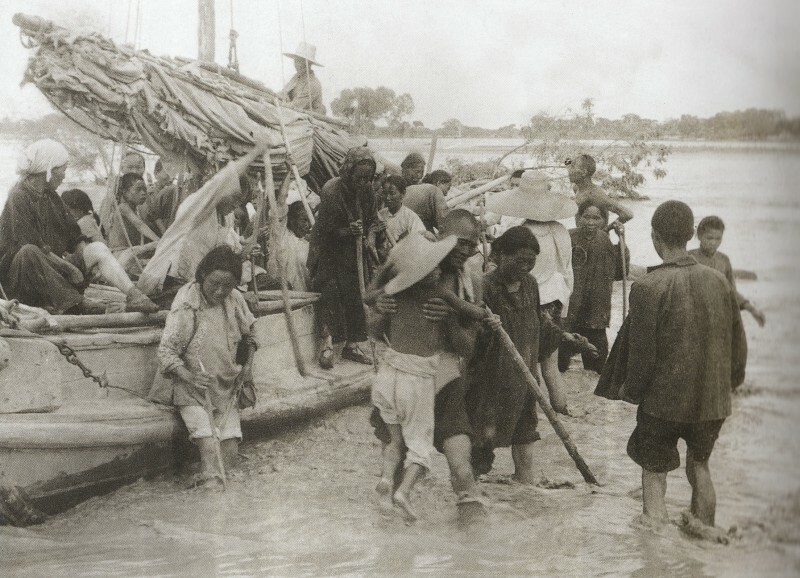 The Nationalist regime’s enlistment of civilian laborers to construct new dikes in the flooded area as a “work relief” project, in which disaster victims received badly-needed assistance in exchange for their labor, only put an additional burden on local society. Like the numerous scorched-earth tactics that the Nationalists employed during the Sino-Japanese War, the breaking of the Yellow River dikes was undertaken in an atmosphere of high-level desperation and panic that grew from the Japanese war of terror. On the other hand, the Nationalist regime showed a willingness to sacrifice people along with resources to keep them out of Japanese hands. The breaking of the Yellow River dikes was the prime example of this tendency. In the eyes of Nationalist leaders, not unlike other modern regimes of the twentieth-century world, “saving the nation” could justify unlimited sacrifice on the part of the civilian population. Throughout the war, the Nationalist government refused to take responsibility for the disasters caused by the Yellow River’s intentional diversion. Instead, the Nationalists claimed that Japanese bombing of the dikes had caused the floods, presenting the disaster as another example of Japanese atrocities against Chinese civilians. Chinese newspaper reports published in the summer of 1938 followed the official version of events. 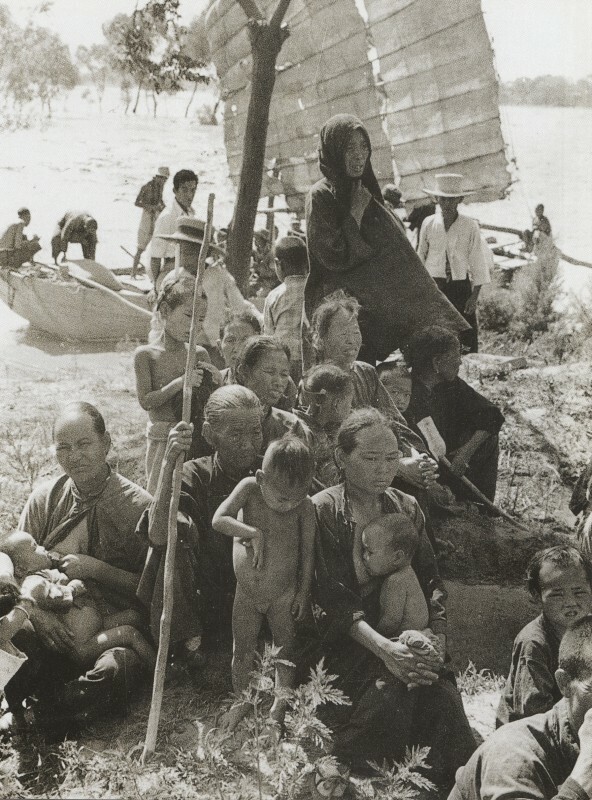 The Japanese denied these accusations, framing the flood as proof of China’s disregard for human life. When the disaster’s true causes eventually came to light after 1945, the Nationalist regime changed the narrative and presented the flood as evidence of sacrifices made by China’s people to save the nation during the War of Resistance. Nationalist soldier directing laborers working on dikes. From a historical perspective, Chiang’s decision was not at all unique. On several occasions prior to the twentieth century, imperial Chinese armies had intentionally diverted rivers to gain the upper hand against their military adversaries and as a strategic barrier against external aggression, doing little to relocate local populations or offer them relief. Chiang Kai-shek and his subordinates perceived and utilized the Yellow River in similar strategic terms. 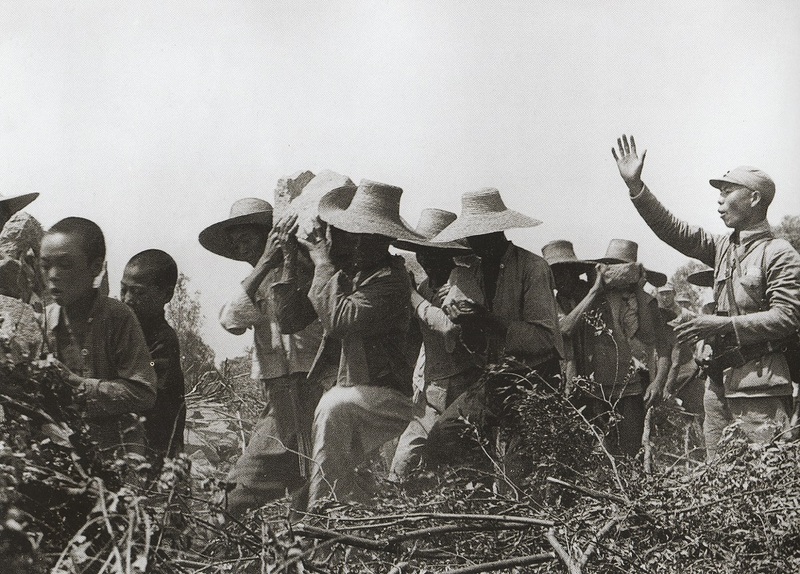 The difference was that, as it struggled to fight a total war against Japanese aggression, the Nationalist regime pursued a far wider mobilization of natural resources and human labor to pursue its strategic goals. The environment became a weapon of war, while humans became resources in the service of military machines, forced to sacrifice their lives and families for the national cause. Recovery from the disaster did not come until after 1945, when large-scale external assistance to the Yellow River flooded area came from the United Nations Relief and Rehabilitation Administration (UNRRA), which launched redevelopment programs in war-damaged areas of China in conjunction with the Nationalist regime’s Chinese National Relief and Rehabilitation Administration (CNRRA). In 1946 and 1947, tens of thousands of laborers supervised by UNRRA-CNRRA returned the river to its pre-1938 course. UNRRA-CNRRA offered material support to refugees who returned to their homes in Henan’s flooded area and assisted them in bringing land back under cultivation, making it possible to turn war-torn environments back into productive agricultural landscapes. Between 1938 and 1945, the precise scale of destruction caused by the flood went largely uncalculated, as wartime instability made accurate quantification impossible. Yet damage reports compiled after 1945 convey the magnitude of the catastrophe (see Table 1 and Table 2 below). Postwar investigations estimated that in the twenty counties of eastern Henan hit by the disaster, for instance, 32 percent of the cultivated land (7,338,000 mu = 489,200 hectares) was inundated. Han Qitong and Nan Zhongwan, Huangfanqu de sunhai yu shanhou jiuji, 18. Han Qitong and Nan Zhongwan, Huangfanqu de sunhai yu shanhoujiuji, 22-23. In the affected counties in Henan, flooding reportedly inundated 45 percent of the villages. Over half the villages in eight of these counties were destroyed, with the total in Henan’s Fugou County reaching over 91 percent. Wartime flooding killed well over 800,000 people and displaced nearly 4 million people in Henan, Anhui, and Jiangsu. In Anhui alone over 400,000 people died, while more than 325,000 people reportedly lost their lives in Henan. According to one postwar estimate, the civilian death toll in Henan’s flooded areas amounted to 4.8 percent of the prewar population. Estimated death rates reached as high as 25.5 percent in Henan’s Fugou County and 26.8 percent in Weishi County. The wartime floods also turned almost four million people – over 20 percent of the total population – in Henan, Anhui, and Jiangsu into refugees. In Henan, the province for which the most detailed statistics are available, the Yellow River floods displaced more than 1,172,000. Refugees displaced by the floods came to 67.7 percent of the total population in Xihua, 55.1 percent in Henan’s Fugou County, 52.2 percent in Weishi County, 32.2 percent in Taikang County, and more than 10 percent in Zhongmu County. The present essay draws upon Micah S. Muscolino, The Ecology of War in China: Henan Province, the Yellow River, and Beyond (Cambridge and New York: Cambridge University Press, 2015). The outstanding Chinese-language history of the floods is Qu Changgen, Gongzui qianqiu: Huayuankou shijian yanjiu (Merits and wrongdoings for a thousand years: Research on the Huayuankou incident) (Lanzhou: Lanzhou daxue chubanshe, 2003). “Huikan Huanghe fangfan xindi baogao” (Survey report on the new Yellow River flood defense dikes) (1940). Institute of Modern History Archives, Academia Sinica, Taiwan: 18-20-02-18-02. In addition to the files held at Academia Sinica, a wealth of documents related to the floods can be found at the Yellow River Archives in Zhengzhou. The Second Historical Archives in Nanjing also holds documents related to the disaster, though access has been quite limited in recent years. “Huanghe shuili weiyuanhui Henan xiufangchu sanshier niandu di yi er qi zhengxiu Huangfan wancheng gongcheng baogaoshu” (Yellow River Conservancy Commission Henan repair and defense office 1943 first and second period Yellow River flood repair project completion report) (1943). Institute of Modern History Archives, Academia Sinica, Taiwan: 25-22-170-(04). “Huanghe shuili weiyuanhui Henan xiufangchu sanshier niandu di yi er qi zhengxiu Huangfan wancheng gongcheng baogaoshu (1943): Institute of Modern History Archives, Academia Sinica, Taiwan 25-22-170-(04). On shifting representations of the flood disaster see especially, Kathryn Edgerton-Tarpley, “From ‘Nourish the People’ to ‘Sacrifice for the Nation’: Changing Responses to Disaster in Late Imperial and Modern China,” The Journal of Asian Studies 73:2 (2014), 447–469. Documents on the Yellow River re-diversion project and recovery efforts launched in the flooded area after 1945 can be found at the United Nations Archives and Records Management Section in New York. Han Qitong and Nan Zhongwan, Huangfanqu de sunhai yu shanhou jiuji (Damage and recovery and relief in the Yellow River flooded area) (Shanghai: Xingzhengyuan shanhou jiuji zongshu, 1948), 13–14, 18. Note that 1 mu is equivalent to approximately 0.0666 hectares. Han Qitong and Nan Zhongwan, Huangfanqu de sunhai yu shanhou jiuji, 7. Edgerton-Tarpley, Kathryn 2014. “From ‘Nourish the People’ to ‘Sacrifice for the Nation’: Changing Responses to Disaster in Late Imperial and Modern China.” The Journal of Asian Studies 73:2, 447–469. Lary, Diana 2001. “Drowned Earth: The Strategic Breaching of the Yellow River Dyke, 1938.” War in History 8:2 (April), 191–207. Lary, Diana 2004. “The Waters Covered the Earth: China’s War-Induced Natural Disasters.” In Mark Selden and Alvin So, eds. War and State Terrorism: The United States, Japan, and the Asia-Pacific in the Long Twentieth Century. Lanham, MD: Rowan and Littlefield. Muscolino, Micah S. 2015 The Ecology of War in China: Henan Province, the Yellow River, and Beyond, 1938-1950. Cambridge: Cambridge University Press.